The RDE Framework is based on the Instruction, Research and Development and Extension Interface. It is propelled by the technology development process from Technology Generation (TG), Technology Verification (TV), Technology Adaptation (TA), Technology Dissemination (TD), Technology Piloting (TP), to Knowledge for Dissemination (KD) and Technology Commercialization (TC). The generators of technology are the researchers, faculty, students, administrators and research collaborators. TV, TA, TD and TP are conducted at the farmersâ€™ level through research cooperators while KD and TC are done at local, regional and national level with industries and communities as adopters. 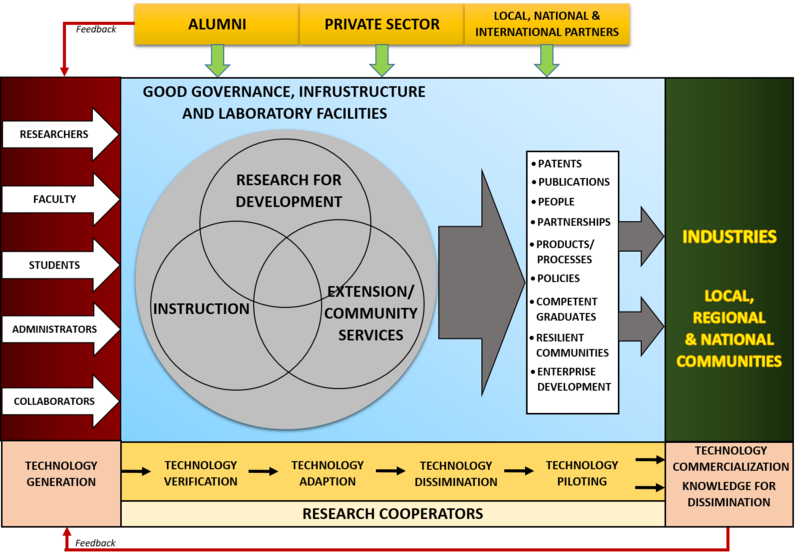 The Instruction, Research, and Extension mission of the university is equipped with physical infrastructure and laboratory facilities managed by good governance to produce competent graduates, resilient communities, and the 6Ps as deliverables of RDE as well as enterprise development as offshoot of production. Financial and technical support from alumni, private sector, and from local and international partners would greatly contribute to the intensification of technology development within the university. Likewise, feedbacking is encouraged for the improvement and advancement of technology innovation undertakings in the university. As the CSU gears up to strengthen its capability in RDE, it needs to embrace and pursue a new RDE paradigm. The Sustainable Development Goals (SDGs) have broadened development outcomes from merely increasing food supply to include poverty reduction, human nutrition, environmental protection and related issues. Similarly, AmBisyon Natin 2040 is the anchor of the countryâ€™s plans. It envisions Filipinos to enjoy a strongly rooted, comfortable, and secured life. As a consequence, RDE at CSU must be linked with the countryâ€™s vision and Cagayanâ€™s development goals to gain more relevance and have significant impact. The emergence of global markets and new technologies, particularly ICT and biotechnology has facilitated a paradigmatic shift in RDE. Towards this, public institutions like SUCs have adapted to the contemporary setting by redefining their priorities, changing their focus towards the poor and marginalized sectors of society. More specifically, RDE are seeing the emergence of new capabilities, organizations, and institutional processes where partnerships are increasingly becoming important. As a result, the process of networking, establishing strategic alliances and coalition building have become very important. In the foregoing context, R4D implements RDE programs and projects that has (1) developmental relevance, (2) links RDE with those who can use it; and (3) deploys a variety of approaches and strategies to ensure that the results of its RDE work is used and incorporated into development processes. CSU should depart from the traditional research and development (R&D) approach and shift to a research for development (R4D) paradigm. R4D links research outputs with development outcomes (e.g., poverty reduction, environmental protection, people empowerment) and priority RDE agenda is formulated with stakeholder engagement. Likewise, RDE thrusts should be based on market demand and inclusive, people oriented development (IPOD) approaches, and conduct Research for Development (R4D). To ensure research relevance, CSU should efficiently produce the expected outputs of research in a focused and coordinated manner, to wit: a) information that advances knowledge; b) usable and commerciable technologies; and c) policy recommendations with majority of the outputs being usable technologies. 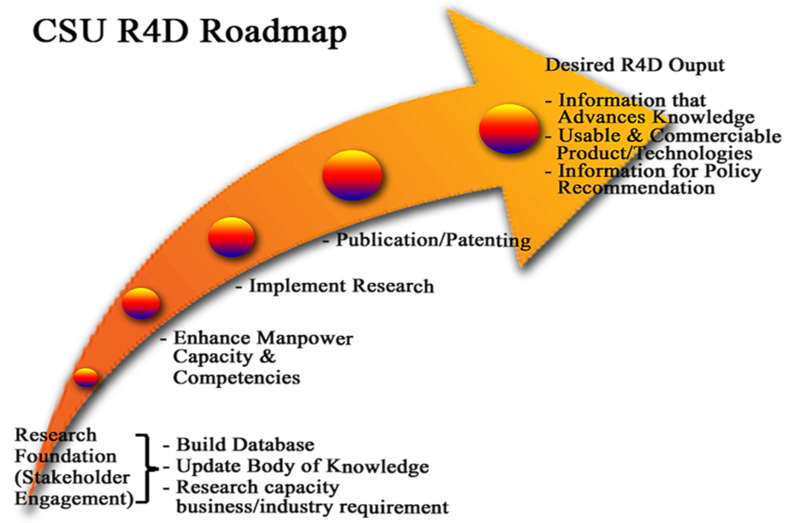 Figure below shows the CSU R4D Roadmap commencing from Research Foundation to accomplishing its desired output. R4D includes the following approaches: 1) analyzing and influencing, 2) advancing innovation, 3) designing, testing and adapting solutions, 4) increasing access to vital products and services, 5) building communities of knowledge and practice and 6) supporting local change agents. The innovation process involves a series of interaction and participation of multiple stakeholders that operate within a knowledge system. Such interactions result in the initiation, generation, modification, accumulation and utilization of improved technology. In the local setting, the innovation process involves the complex, iterative, and dynamic interaction among various groups of stakeholders involved in the agriculture RDE spectrum. Groups of organizations and individuals involved in the generation, sharing, adaptation, and use of knowledge of socio-economic significance. The institutional context that governs the way these interactions and processes take place which includes the numerous norms and conventions that shape the way things are done, as well as more formal institutions such as intellectual property regimes and others. The innovation process involves not only scientific research institutions, but also a range of other non-research organizations. Due to the foregoing, innovations come from various sources: researchers, extension workers, development agencies, farmers, civil society organizations (CSOs), the private sector and entrepreneurs. The diversity of various actors brings in a diversity of interests and knowledge systems, which could be both conflicting and complementary. Innovations and impacts from research in the life sciences (biotechnology in particular) are increasingly dependent on new groupings, alliances, and relationships within science, and between science and the private business sector. Hence, the innovation process recognizes the importance of linkages, communication, public-private partnerships, coalitions and the way these assist information flows. Since the innovation process depends on relationships among different people and organizations, managing these relationships is a central task of RDE. Likewise, the conventions or institutions governing the way RDE activities are conducted, and the role assigned to different organizations are pivotal to the innovation process. In the Cagayan setting, the innovation process involves the complex, iterative, and dynamic interaction among various groups of stakeholders involved in the RDE spectrum. Hence, RDE must be carried out with the broad involvement of partners and stakeholders in the provinceâ€™s development spectrum. Moreover, in agricultural innovations systems, CSU adopts a perspective which posits strong linkages between ecosystems and people. In this context, innovations are embedded in three inter-dependent and interacting systems: 1) agriculture and fisheries; 2) natural resources; and 3) social systems. Agriculture innovation systems involve the production, processing and marketing of crops, livestock, fisheries aqua marine and trees for food, feed, clothing and shelter. Their productivity and sustainability are driven by changes in climate, technologies and arrangements in the countryâ€™s natural resource systems and ecological services. Social systems are characterized by population size and quality, culture, peace and order and tenure systems. Finally, governance integrates the manner how these systems are harnessed for human well- being.